DSQ-Ranker is a tool that helps you to find the best-rated answers and make finding the information you want easier. DSQ-Ranker is built around a DR Overall Score which provides a rank for each answer and a weighted score that actually means something. How do you calculate the DR Overall Score? The score is calculated from a number of weighted values taken from both user comments, user 1`s, user Quick Ranks and ratings from the members of our expert panel. Our programmers have spent countless hours fine-tuning the DR Overall Score algorithm until finally settling on a formula that generates a meaningful score for every answer. What is a Quick Rank? A Quick Rank is a way for you to quickly vote on an answer without having to provide any other information. When should I have a Quick Rank? You can have a Quick Rank even if you haven`t seen the answer yet - use it to simply show how pleased or disappointed you are that the answer is there. Quick Ranks don`t carry as much weight in the YR Overall Score as a user review but it all adds up and could help put your favourite answer on the Leaderboard! When should I write a comment? We think comments and 1`s are more valuable than Quick Ranks so we weight them heavier when we calculate the DR Overall Score. Can I write help articles for your site? No promises but we`d like to see whatever you want to send us. Why don`t you have the answers I want and how can I ask a new question? 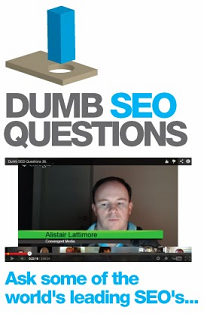 Ask new questions on the Dumb SEO Questions community on Google . Click the link at the bottom-right of this page to reach the community. Should I start a whole new website?